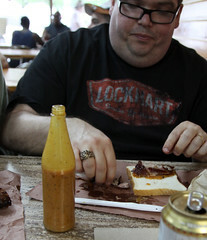 My visit to City Market was part of the Central TX BBQ Run. First of all, let’s note that this isn’t a repeat review… the previous place was “City Meat Market” in Gidding’s, TX. This place is just “City Market” located in Luling, TX (which apparently bills itself as the “watermelon capital of Texas”, home of the annual “Thump Queen” pageant), but like so many of the venerable central Texas barbecue shrines, the name comes from a history of being a meat market well before it was a barbecue stand. Sitting on the main corner in Luling, TX, it’s one of the central attractions in downtown, taking up two modest store fronts on the main drag in town. It’s also rather popular, and we were lucky to arrive when we did. While we had almost no wait, by the time we left, the lunch crowd had arrived and the the line was at least 75 people deep stretching through the dining rooms. Heading inside, City Market features a relatively large dining area, spanning two dining rooms, with large roomy tables. There’s a beverage and side fixin’s counter up front, but for the real action you need to head to the back. Walking through to the back of the dining room, you go through the “Order Meat Here” door into the smoke room. City Market definitely has one of the more in-your-face smoking operations; once you pass through that door, you’re standing feet from the firebox, there’s little maneuvering room, and a lot of smoke. If I had somehow made it through my day’s barbecue adventures without picking up smoke smells on my clothing, that didn’t survive a trip to the ordering counter at City Market. 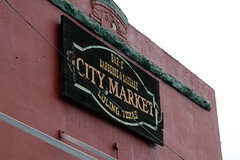 However, the routine at City Market is the same as most of the other places. We sidle up to the counter, the pit folk take your order, slice it in a most serious manner, and pile the whole mess on butcher paper as they call out the tally to the person running the register. Gather up the sides of the paper, and you carry the giant hammock of meat out to the table. The ordering ritual completed yet again, it was time to dig into the the actual meat. Despite being my fourth stop for barbecue this trip (the seventh for most of my friends), and the third this day (and only barely turning noon! ), I quickly found myself hungering for the tasty meat arranged before me. Why? Because the meat here was excellent. Starting with the brisket, it had a near-perfect bark, very nicely seasons with salt and a lot more pepper than most joints, all caramelized into a nice covering for the meat. 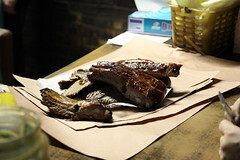 Inside the bark, there was a nice, bold smoke line and the smoke perfused throughout the entirety of the meat. Both lean and fatty cuts were well nicely cooked, with fat just starting to soften and liquify. The meat was tender, and fully flavorful. The pork ribs were also near-perfect in execution. 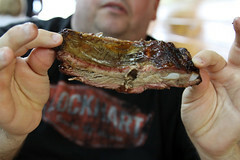 The meat was tender and fully-smoked, with a nice bark with the same peppered rub as the brisket. They weren’t too shabby with the sausage, either, having a grind that was coarse, but a consistency that held up a lot better than most of the other sausages on this trip. And, unlike most of our stops, which either didn’t have any sauce at all (Kreuz) or places that downplayed their sauces (Snow’s and City Market), City Market is actually pretty proud of their sauce, with every table having several bottles of it (along with signs imploring you to leave the bottles on the table). It’s actually a really good sauce, a sort of dark orange blend, a little bit on the sweet side, with some nice hot pepper and mustard notes. Several of us grabbed slices of bread, random bits of leftover meat debris, and the sauce bottle, making up little sandwiches. Delicious. As far as barbecue joints go, Luling was the first one from the trip where the meat really spoke to me, saying “it was worth coming here.” Not only was the brisket excellent, but quality was good across the board. While all of the places I had gone before City Market were good, any doubts about spending the time and money to fly down to Austin were erased by coming here. Not only was the brisket good, all of the meat was consistently good and not lacking in any way. 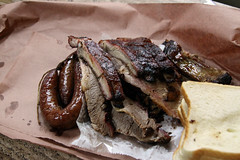 City Market has long been held up as one of the central shrines of Texas barbecue, and it has definitely earned this reputation.